No matter their age, children rely on their parents and caregivers to keep them safe. When traveling, the best ways to protect them are to place them in the right car seats for their ages and sizes, to install the seats correctly, and to ensure that the car seats fit properly in the back seat of your vehicle. 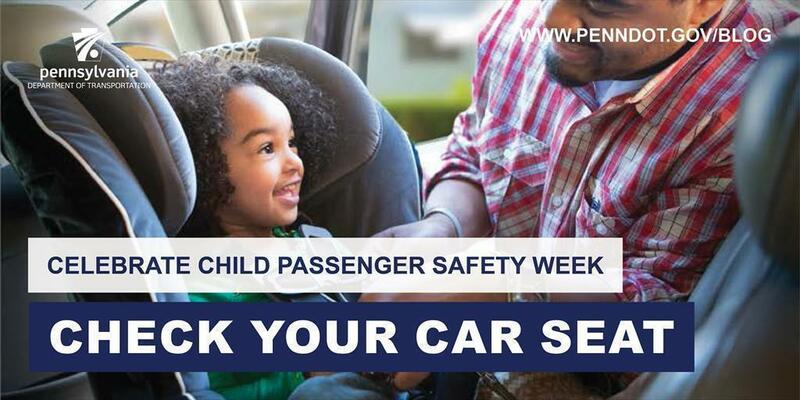 For Child Passenger Safety Week (Sept. 23-29, 2018), PennDOT and the Pennsylvania State Police encourage motorists to take advantage of safety seat check resources across the state. There are more than 190 fitting stations across Pennsylvania. PSP checked more than 1,900 seats last year and found more than 750 misuses by drivers. The checkups are designed to teach proper installation and use of child safety seats. National statistics show that, from 2012-2016, there were 3,268 children under 13 killed while riding in passenger vehicles. On average, nearly two children under 13 were killed every day in 2016 alone. On the other hand, car seats saved an estimated 328 lives among children under 5 in 2016. In passenger cars, car seats reduce the risk of fatal injury by 71 percent for infants and by 54 percent for toddlers. Most parents are confident they have correctly installed their child's car seat, but in most cases (59 percent) the seat has not been installed correctly. That's where PennDOT and PSP can help. For a list of state police car seat safety inspection locations, visit the Public Safety section of the PSP website. To view a list of PennDOT-supported car seat checks and for more child passenger safety resources, visit the department's Child Passenger Safety page. So, what is the law in Pennsylvania? First things first, get familiar with Pennsylvania's child passenger safety laws (PDF). These are all primary laws, which means law enforcement can stop you for these offenses alone. Violators are fined $75 plus court costs and other fees. Fines collected are placed in a fund and used to purchase car seats for loaner programs. For more information on child passenger safety, visit PennDOT's Child Passenger Safety page or the Car Seats and Booster Seats information center from the National Highway Traffic Safety Administration.